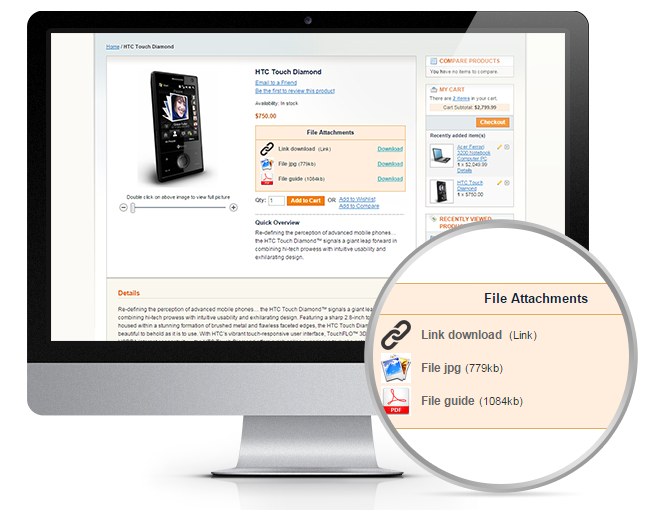 Magento product attachments extension allow admin to attach various types of file as pdf file, image, txt... & download or view these files on product page. 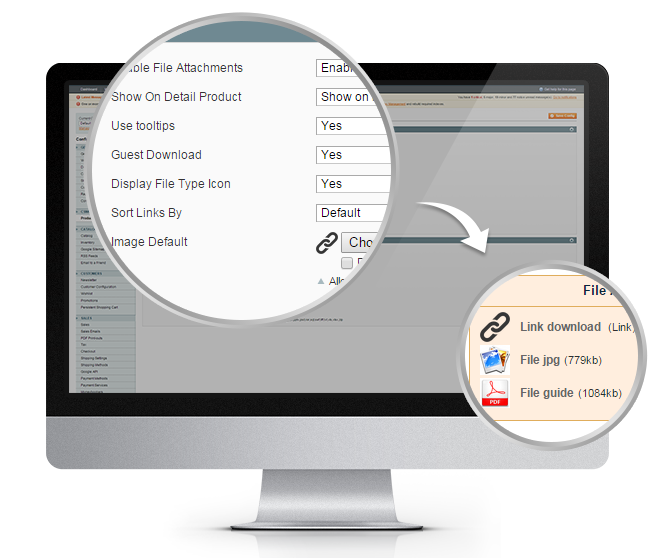 Magento product attachments extension allows admin to attach various types of file as PDF file, image, txt... & download or view these files on product page. Product File Attachment, a very unique facility being developed by our team will definitely bring your customers a greater experience. Getting to know your final goal of boosting products' sales. The extension is developed to maximize spaces and simplify actions. A perfect attached file which has suitable height, width, and size for your requirement will be created through adjustment in file setting. In the frontend screen, a list of files attachment is presented below the product’s price with set-up icons, file type, name and size. Therefore, the download link being next to the icon files will be the best position for customers. 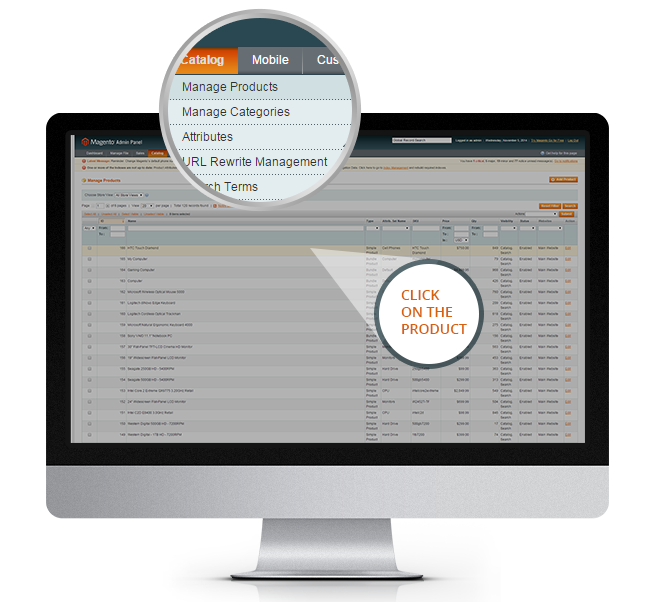 Product File Attachment extension is developed to enhance the support for the main product. Configuration can be customized flexibly in admin panel. A perfect attached file which has suitable height, width, and size will be adjusted. Now try its Live Demo to get actual experience. We believe that you will fall in love with it at first sight. Include icons displaying beside the download link. 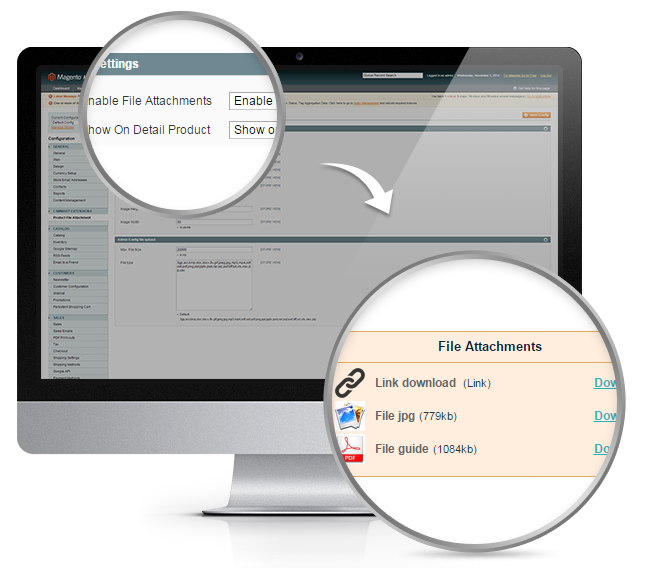 In the backend, admin can enable or disble files attachment. 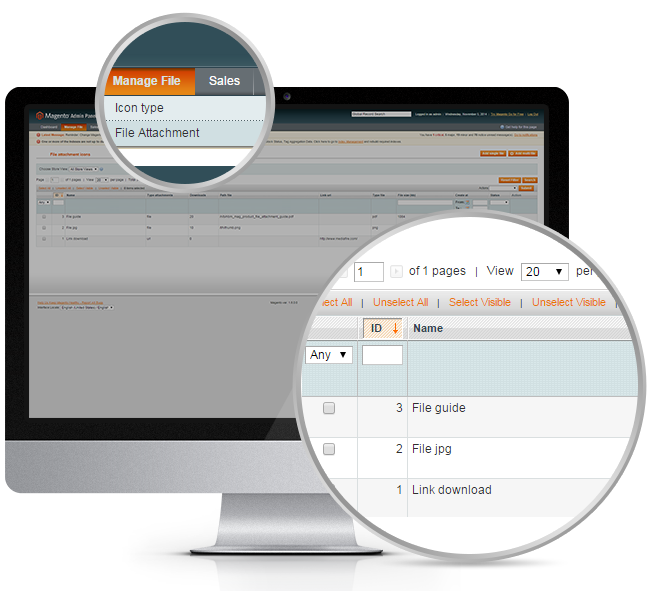 Magento product attachments extension allows admin to attach various types of file as PDF file, image, text... & download or view these files on the product page. Product File Attachment, a unique facility being developed by our team will definitely bring your customers a greater experience. Get to know your final goal of boosting products' sales, the extension is developed to maximize spaces and simplify actions. A perfect attached file which has suitable height, width, and size for your requirement will be created through adjustment in file setting. In the frontend screen, a list of files attachment is presented below the product’s price with set-up icons, file type, name, and size. Therefore, the download link being next to the icon files will be the best position for customers. 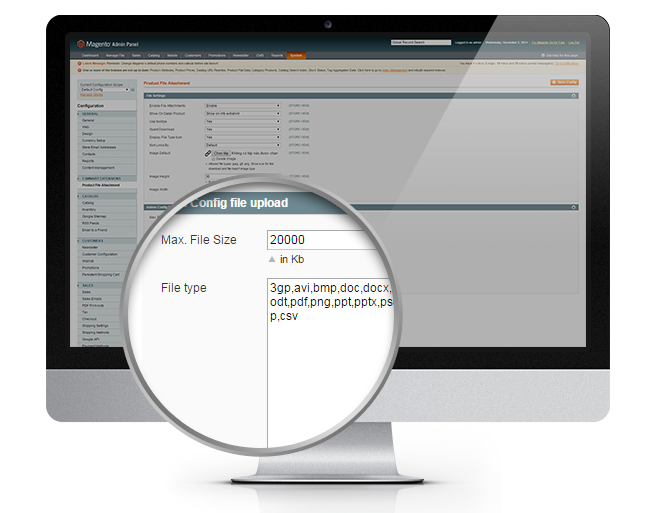 Product File Attachment extension is developed to enhance the support for the main product. Configuration can be customized flexibly in the admin panel. A perfect attached file which has suitable height, width, and size will be adjusted. Step 1: Go to product detail page. You will see a list of files attachment is presented below the product’s price with set-up icons, file type, name, and size. Step 2: Go to System → Tools → Compilation → Disable to Cache and index data management. 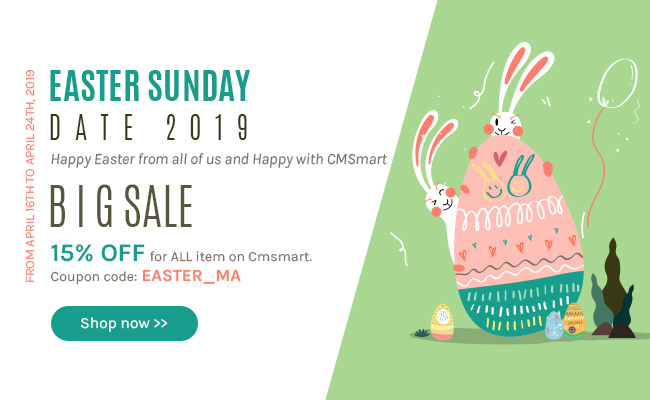 Step 3: Go to System → Configuration → Cmsmart Extensions → Product file attachment to configure Product File Attachment Extension as you want. Step 4: Go to Manage File → Icon Type, chose image then click product detail or click “Add Type” to setup Icon type file. Step 5: Go to Manage File → File attachment → Chose product detail or click “Add Single File”, then setup as the user guide. Easily take action with files: In the frontend screen, a list of files attachment is presented below the product’s price with set-up icons, file type, name, and size. Therefore, the download link being next to the icon files will be the best position for customer’s view. Easily take action with files. Admin can add attachment file type. Admin can configure file size and file type in Back-end. Setting default icons or upload icon for file attachments. Displaying a list of files. Download file option or view files option using Google document viewer. Support very good and the results was amazing, I recommend to everyone.